Thanks to Kristin for this great review. 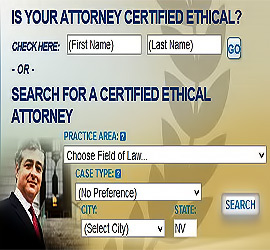 To search for a Certifed Ethical Family Lawyer, visit www.attorneyguide.com. My name is Kristin, I am in Reno, and I had never hired or needed legal representation until a custody issue escalated with my son’s father/ex-husband and had no idea where to start. With that being said, to make sure I was fully confident, I met with 6 different firms in the area, anywhere from no consultation fee to $300. Banales and associates was my 4th visit and right away I knew I was most likely going to hire them. I chose Gabrielle Carr not only for her professional background but for her kind and honest disposition in that she understood where I was coming from and was confident in her ability to assist in the situation. She is VERY knowledgeable, VERY easy to work with and made my unfortunate situation seem less worrisome by having her in my corner. I was very impressed with the logical way she approached the opposing legal team regarding the issues. Her effective, calm and assertive tactic by knowing almost every statute and law that pertained, by heart came in very handy in argument when she stood ground for me. She believed in what I was standing for regarding my son and truly cared about my son and I’s well being. She met and exceeded all of my expectation and I have since not hesitated to contact her for advice. She is by far, the best option in family Law. Banales and associates is honorable in their reputation: They aren’t out to clean out your wallet (her paralegal Lidia is very kind and Gabrielle uses her whenever possible to save on hourly rates), also (as odd as this sounds) they are worthy of your trust. I now consider Gabrielle a friend and will come back to her in the future for all my needs. She is simply wonderful.